Colossal is a 2016 science fiction black comedy film directed and written by Nacho Vigalondo. The film stars Anne Hathaway, Jason Sudeikis, Dan Stevens, Austin Stowell, and Tim Blake Nelson, telling a story about Gloria, an unemployed young writer played by Hathaway, who is unwittingly causing a giant monster to wreak havoc halfway across the world. The film's world premiere was at the 2016 Toronto International Film Festival. It was released on April 7, 2017 by Neon, the company's first release. Filmed in six weeks on a budget of $15 million in Vancouver, the film received mostly positive reviews but only grossed $4.5 million at the box office. Gloria is an unemployed writer struggling with alcoholism. Her errant behavior prompts her frustrated boyfriend Tim to break up with her and evict her from their New York City apartment. Forced to move back to her hometown in New England (the fictional Mainhead), Gloria reunites with her childhood friend Oscar, who now runs his late father's bar. Oscar is warm and welcoming to Gloria; he brings her an old television set for her unfurnished house and offers her a job at the bar to help her, which Gloria accepts. Working at the bar aggravates Gloria's alcohol problem. Each shift, she hangs out and drinks until morning with Oscar and his friends, Garth and Joel, while sleeping it off on a bench near a children's playground. At the same time, a giant reptilian monster appears in Seoul, leaving death and destruction in its wake. Gradually, Gloria realizes that when she walks through the playground at exactly 8:05 am, she causes the monster to manifest and is able to remotely control the monster's movements, which mirror her own. Gloria reveals her secret to Oscar and his friends; however, when Oscar steps onto the playground, he causes a giant robot to appear in Seoul. Gloria ultimately tries to make amends by having the monster spell out an apology in Korean, to the delight of the South Koreans and the media, and begins to avoid both the playground and alcohol. After spending the night with Joel, Gloria discovers that a drunken Oscar is using the robot to taunt South Korea. After a tense confrontation, Gloria manages to make him leave. Oscar is jealous, believing that something happened between Gloria and Joel. Later that night at the bar, he drunkenly insults his friends and demands that Gloria drinks, then orders her to do so by threatening to return to the playground if she does not. The next morning, a sobered-up Oscar confesses his remorse and pleads with Gloria to forgive him. Gloria accepts his apology, but Oscar's controlling attitude becomes clear. Tim shows up in town on a pretense in order to see Gloria. Oscar provokes a confrontation that ends with him setting off a large firework inside the bar. He follows this up by boasting that, no matter how he behaves, he knows that Gloria will remain under his thumb. He later shows up at Gloria's house, telling her he is there to prevent her from going back to New York with Tim. A flashback reveals how Gloria and Oscar are able to manifest their avatars in South Korea: a freak lightning flash struck both of them, a toy robot and a toy reptilian monster while they were passing through the playground when they were children. Gloria also realizes that Oscar has always been violent and manipulative because he hates himself, and resolves to leave town with Tim. Oscar, in response, heads for the playground. When Gloria follows, Oscar assaults her, leaving her on the ground while he terrorizes Seoul. Upon returning to her house, Gloria comes up with a plan to stop Oscar. She flies to South Korea, apologizing to Tim for not coming with him. Once again at 8:05 am, U.S. time, Oscar causes the giant robot to manifest in Seoul. As she heads towards Oscar's avatar, Gloria causes her monster to appear again, this time at the playground back home. Clutching Oscar in her hand, Gloria's monster throws Oscar off into the distance, causing the giant robot to be launched into the sky, disappearing from Seoul. Her mission accomplished, Gloria retreats to an empty bar in Seoul. Settling into her seat, Gloria promises the young waitress an incredible story. Offered a drink, Gloria simply lets out a long sigh. Hathaway was the first actress to sign on at a time when the project had no financial backing. Hathaway heard about the script after finding herself "in a little bit of an artistic no man's land" for inspiration. Director Jonathan Demme screened for her a copy of A Field in England, after which Hathaway decided that it represented exactly the type of movie she wanted to make. After asking her representation to see a similar script that she could join, she was sent the Colossal script. Hathaway found herself attracted to the genre-hopping nature of the script, later comparing it to Being John Malkovich, one of her favorite films. Prior to the start of filming, Japanese company Toho brought a lawsuit against Voltage Pictures for unauthorized usage of Godzilla's image and stills from previous Godzilla films in emails and press documents sent to potential investors. A settlement was reached that October. Principal photography on the film also began that month in Vancouver, and ended on November 25, 2015. No motion captured footage was used for the creation of the monster; rather, footage of Hathaway acting out her parts was given to the CG team, who used this as reference points. The CG artists, as opposed to Vigalondo, were responsible for the look of the monster itself. Vigalondo stated that this was partly due to his lack of artistic skill and partly due to him "[wanting] them to feel like characters that felt like a part of the genre we're playing with". The film had its world premiere at the Toronto International Film Festival on September 9, 2016. Shortly after, an unnamed Chinese company acquired distribution rights to the film, which was later announced as Neon, a newly-founded distribution company. The film went on to screen at the Sundance Film Festival on January 20, 2017. The film was released on April 7, 2017. It grossed $3,189,184 in the U.S. market and $1,151,575 in other markets, totaling $4,340,759. On review aggregator website Rotten Tomatoes, the film has an approval rating of 80% based on 194 reviews, with an average rating of 7.2/10. The site's critical consensus reads, "Colossal's singular strangeness can be disorienting, but viewers who hang on may find that its genre-defying execution—and Anne Hathaway's performance—is well worth the ride." On Metacritic, the film has a score of 70 out of 100, based on 36 critics, indicating "generally favorable reviews". Writing for RogerEbert.com, Matt Zoller Seitz awarded Colossal 3.5 out of 4 stars, stating "I'll just say that the cast is quietly superb, that the movie always knows what it is and what it wants to say." IGN awarded it 7.0 out of 10, saying "It isn't always successful, but when the film works, it's a blast—another completely original and unique genre mash-up from the mad mind of Nacho Vigalondo." Peter Travers of Rolling Stone awarded it 3.5 out of 4, saying "Colossal is seriously unmissable". Jake Coyle writing for the Associated Press gave it 2 out of 4 stars, saying "The one-trick act of 'Colossal' becomes tiresome even as its leads—particularly an excellent Hathaway—work to find some depth in the story." Mark Jenkins of NPR said "The longer the movie runs, the more its novelty fades. The tone wavers, and plot holes that appeared small at the halfway point start looking like chasms." Rex Reed of the New York Observer gave it 0 out of 4 stars, saying the film was "almost as unwatchable as it incomprehensible". ^ Pinto, Jordan (29 August 2016). "Colossal added to San Sebastian lineup". Playback. Retrieved 19 May 2017. ^ "Colossal – PowerGrind". The Wrap. Retrieved April 9, 2017. ^ a b "Colossal (2017) - Financial Information". The Numbers. Retrieved August 12, 2017. ^ a b Winfrey, Graham. "TIFF 2016: Anne Hathaway Made Monster Movie 'Colossal' For Her 16-Year-Old Self". Indiewire. Retrieved 1 July 2017. ^ a b Zuckerman, Esther. 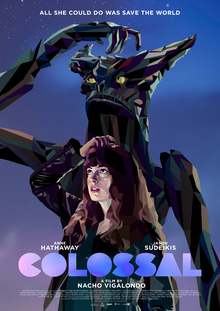 "Colossal's monsters helped Anne Hathaway and Jason Sudeikis understand men's rights activists". AVClub. Retrieved 1 July 2017. ^ Siegemund-Broka, Austin (May 19, 2015). "Anne Hathaway Lizard Film Under 'Godzilla' Attack in New Lawsuit (Exclusive)". The Hollywood Reporter. Retrieved October 19, 2015. ^ Gardner, Eriq. "Anne Hathaway Monster Movie Settles Lawsuit From Godzilla Rights Holders". The Hollywood Reporter. Retrieved November 2, 2015. ^ Punter, Jennie (October 7, 2015). "Anne Hathaway-Starrer 'Colossal' Ignites Voltage, Brightlight Sales Deal". Variety. Retrieved October 19, 2015. ^ Pedersen, Erik (October 16, 2015). "'Colossal' Role For Tim Blake Nelson". Deadline. Retrieved October 19, 2015. ^ "On the Set 10/22/15: Tom Hiddleston Starts on 'Kong: Skull Island, Nina Dobrev Starts on 'Crash Pad'". SSN Insider. October 23, 2015. Archived from the original on 2015-10-25. Retrieved October 27, 2015. ^ "On the Set for 12/4/15: Gal Gadot Grabs Her Lasso for 'Wonder Woman', Brad Pitt Wraps 'War Machine', 'Resident Evil' Team Finish Final Chapter". SSN Insider. December 4, 2015. Archived from the original on 2017-06-10. Retrieved January 1, 2016. ^ a b Puchiko, Kristy. "How Monsters & Rom-Coms Come Together For Colossal". Screenrant. Retrieved 1 July 2017. ^ Lawson, Richard (September 9, 2016). "Anne Hathaway Faces a Very Modern Monster in Charming, Surprising Colossal". Vanity Fair. Retrieved January 13, 2017. ^ Fleming, Mike, Jr. (September 13, 2016). "Anne Hathaway Sci-Fi Pic 'Colossal' Sells To Mystery Chinese Buyer—Toronto". Deadline Hollywood. Retrieved January 13, 2017. ^ Verhoeven, Beatrice (September 14, 2016). "Anne Hathaway's 'Colossal' to Be Released by Tom Quinn and Tim League's New Distributor". TheWrap. Retrieved January 13, 2017. ^ "Colossal | Sundance Institute". Sundance.org. Retrieved 2017-04-09. ^ Fleming, Mike, Jr. (January 13, 2017). "Tom Quinn & Tim League Launch Distribution Shingle Neon For Sundance". Deadline Hollywood. Retrieved January 13, 2017. ^ "Colossal (2016)". Rotten Tomatoes. Retrieved April 7, 2017. ^ "Colossal reviews". Metacritic. CBS Interactive. Retrieved April 7, 2017. ^ Zoller Seitz, Matt (April 7, 2017). "Colossal Review". RogerEbert.com. Retrieved May 7, 2017. ^ Tilly, Chris (September 30, 2016). "Colossal Review". IGN. Retrieved May 7, 2017. ^ Travers, Pete (April 4, 2017). "Colossal Review". Rolling Stone. Retrieved May 7, 2017. ^ Coyle, Jake (4 April 2017). "Review: In 'Colossal,' the inner monsters are literal". AP News. Retrieved 18 October 2017. ^ Mark Jenkins (2017-04-06). "Anne Hathaway As A 'Colossal' Trainwreck Who Wreaks Monster-Movie Havoc". NPR. Retrieved 2017-06-27. ^ Rex Reed (2017-04-07). "'Colossal' Is Monstrously Stupid". Observer. Retrieved 2017-06-27.